Founder of Top End Wheelchair Sports 1987. Market leader in product design for challenged athletes dedicated handcyclists. 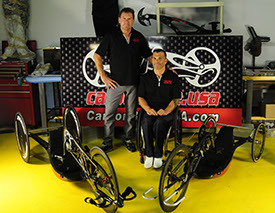 I look forward to working with my partners and athletes to make Carbonbike USA the world leader in handcycle development and performance. My history with starting top end wheelchair sports and designing and building a large variety of different sports chairs and handcycles gives me a clear view of what theses athletes and customers deserve. In 1993, I was injured in a motorcycle accident which left me T 3/4 paralyzed. My personal record was 1:03 hour in marathon 2015 Silver medal H3 category in EHC. In 2010, I started working with Franz Nietlespach and Carbonbike.ch. I realized my passion, and is was not only racing but helping other athletes. I learned many things in business and now I look forward to working with my new partner, Chris Peterson. I vow to do the best I can to improve handcycles and make Carbonbike USA the best handcycle ever built.